Ordinarily when a plane or copter enters Return to Launch (RTL) mode (typically triggered by an autopilot failsafe), the default behaviour is to return to the Home point, but there are often cases when that can be undesirable. For example it may be an area full of people or property and a system running in RTL mode may very likely be in a state that merits extreme caution! It is also possible that the flight plan is large enough that should the aircraft enter RTL mode it is undesirable to traverse all the way back to the point of takeoff. For this reason we now support the creation of multiple Rally Points. Should an aircraft enter RTL and Rally Points have been defined then it will proceed to the closest Rally Point, rather than proceeding to the Home position. Plane will then loiter at that location, and Copter will perform an automated landing there. A flight plan with Rally Points. 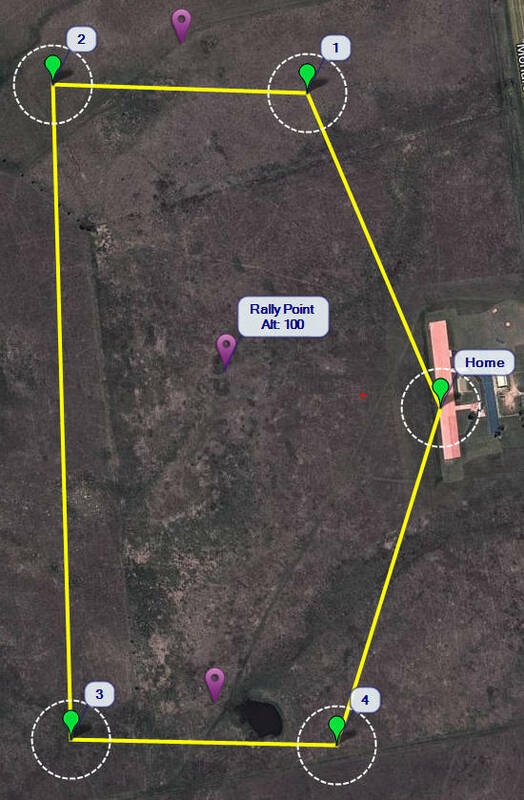 Rally Points are denoted with Purpleplace markers. Mousing over a Rally Point will give its loiter altitude(as in the middle point above). Repeat for all desired Rally points! If using a geofence: its HIGHLY recommended the Rally Points you intend to use at your event are inside the geofence. Make sure Rally Point altitudes are high enough to clear terrain and buildings. Because of the limited flash memory size on the APM2.x hardware the number of Rally Points is restricted to 10 on Plane and 6 on Copter – this limit may be expanded on other platforms such as Pixhawk in the future. On Plane, loiter radius for a Rally Point is the same as all other loiter points; determined by the WP_LOITER_RAD parameter. The ALT_HOLD_RTL RTL_ALT parameters are NOT used with Rally Points! The aircraft will transit to the Rally Point at the altitude specified when adding that point. RALLY_LIMIT_KM is the maximum distance a Rally Point may be from the aircraft to be considered for an RTL event. 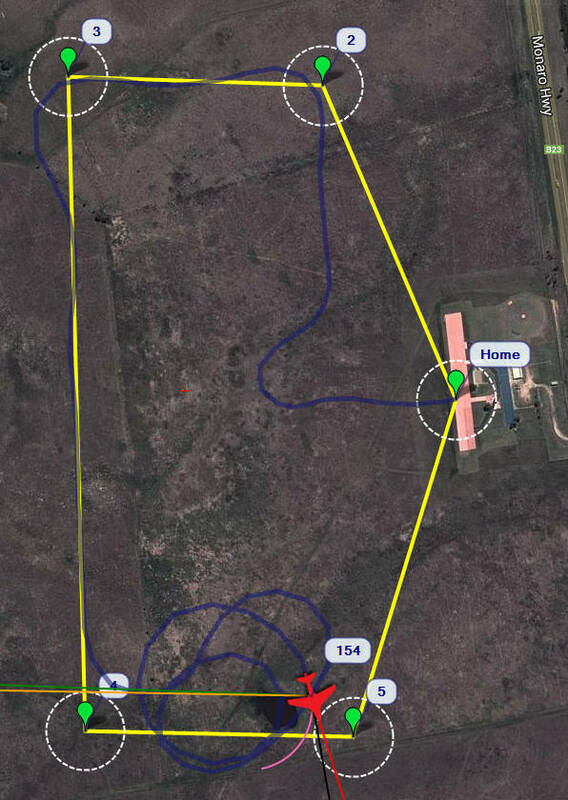 If all Rally Points are greater than this distance from the aircraft, then the Home location is used for RTL events (at altitude ALT_HOLD_RTL) unless Home is farther away than the nearest Rally Point – in which case the nearest Rally point is used. 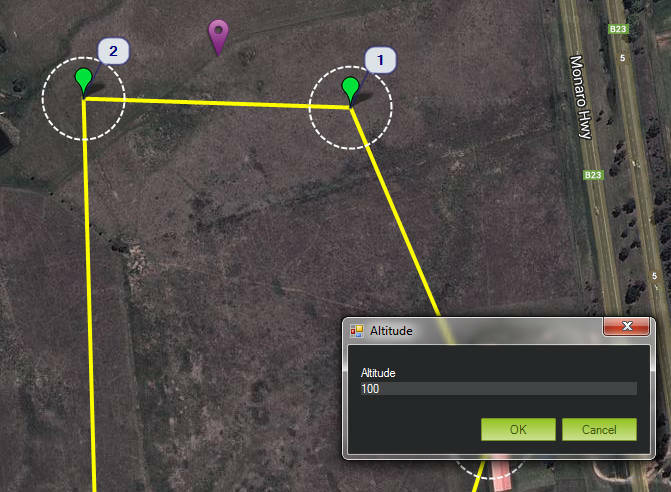 This parameter is to prevent fly offs if Rally Points have been specified for multiple flying fields. This parameter can be disabled if set to 0. RALLY_TOTAL is the number of Rally Points currently specified. This parameter will be set for you by your ground control station (e.g., Mission Planner) when you add and remove Rally Points. IT IS HIGHLY UNLIKELY YOU WANT TO SET THIS PARAMETER MANUALLY AND IT IS PROBABLY UNSAFE TO DO SO. RALLY_TOTAL should be 0 if you have specified no Rally Points and in this case the Home location will be used for RTL events. Flight in which RTL was commanded nearwaypoint. Plane began loitering about the southernmost RallyPoint.